The monument is located near Grande-Allée East. Unveiled on November 4, 2003, this Québec City monument was installed a first time on the façade of the Hôtel du Parlement in 1921. It is the work of sculptor Henri Hébert, the son of the illustrious Louis-Philippe Hébert. 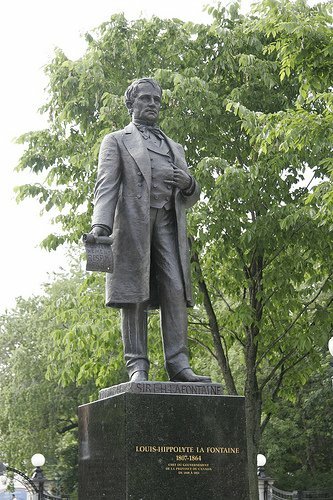 Following an important reorganization of the façade and the failure of the first monument project, the statue was moved to Boucherville, La Fontaine's birthplace, in 1982. In order to commemorate the memory of Louis-Hippolyte La Fontaine in his native region, a copy of the work was donated by the Commission de la capitale nationale de Québec to the City of Longueuil. It was installed in summer 2003, in Parc De La Broquerie, near the house of the famous reform leader of the 19th century.